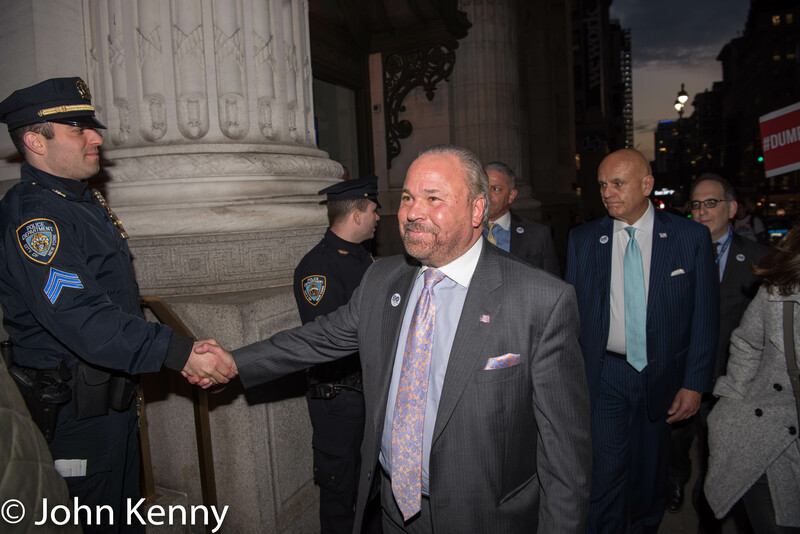 The second and final 2017 mayoral debate occurred tonight, among incumbent Democrat Bill de Blasio, Republican Nicole Malliotakis and independent Bo Dietl. We have a photo gallery from the scene outside the debate. The pre-debate was markedly less energetic than the lead-in to the first debate. Tonight about 40 de Blasio supporters filled half of their allotted pen, chanting and waving signs for more than an hour. At the first debate the de Blasio supporters had a brass band; tonight they had only their voices. Those de Blasio supporters greatly outnumbered the 10 or so Dietl supporters and the 5 or so Malliotakis supporters put in separate pens down the block. Bo Dietl and Bill de Blasio appeared briefly with their supporters. Nicole Malliotakis did not.